Climate Change is a multifaceted issue, which is due to the fact that there is no single consequence that takes precedence over the others. However, one undeniable consequence is the effect rising sea levels will have, thanks to rising temperatures and melting polar ice caps. Unfortunately, a new paper from Eric Rignot at NASA’s Jet Propulsion Laboratory claims that some glaciers in West Antarctica “have passed the point of no return”. A section of glaciers along West Antarctica’s coastline on the Amundsen Sea was previously predicted to be solid enough to last thousands of years. However, the JPL report finds that the ice will continue to slip into the water and melt much faster than expected. These massive glaciers are releasing tremendous amounts of water each year, nearly the equivalent of the entire Greenland Ice Sheet. 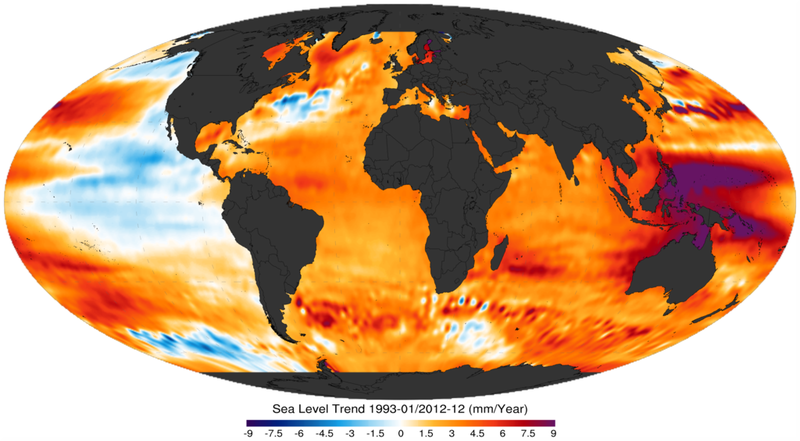 When they are gone, they will have increased sea-level by about 1.2 meters (4 feet). Rignot and his team came to this conclusion after analyzing three critical factors of glacier stability: slope of the terrain, flow rate, and the amount of the glacier floating in the water. Flow rate was the topic of a paper Rignot’s team published previously in Geophysical Research Letters where they determined the flow rate of these Antarctic glaciers has increased over the last few decades. The current paper discusses the slope and how much of the glacier is actually floating on seawater. 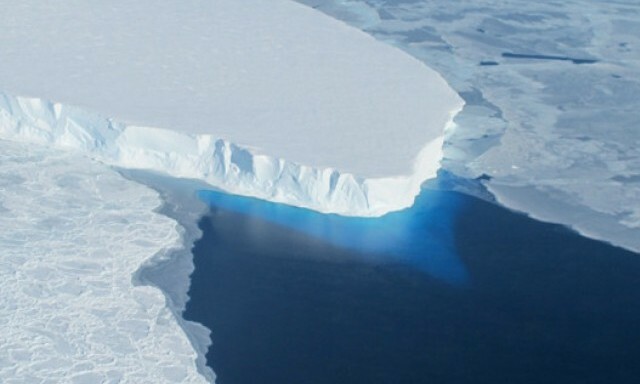 The collapse of this sector of West Antarctica appears to be unstoppable. 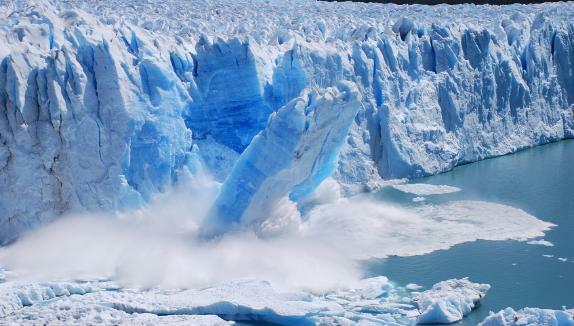 The fact that the retreat is happening simultaneously over a large sector suggests it was triggered by a common cause, such as an increase in the amount of ocean heat beneath the floating sections of the glaciers. At this point, the end of this sector appears to be inevitable. Another recent study, which appeared last month in the journal Nature, addressed another major problem threatening the polar ice caps. This study, which was compiled by researchers from the National Institute of Water and Atmospheric Research and The University of Newcastle, found that ocean waves that are whipped up by storms hundreds or even thousands of miles away from Earth’s poles, could play a bigger role in breaking up polar sea ice and thus contributing to its melt more than had been thought. According to the study, these waves penetrate further into the fields of sea ice around Antarctica than current models suggest, and that bigger waves might be more common near the ice edges at both poles as climate change alters wind patterns. 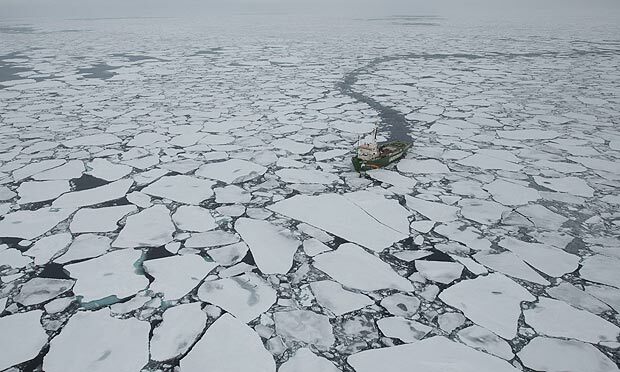 Incorporating this information into models could help scientists better predict the patterns of retreat and expansion seen in the sea ice in both Antarctica and the Arctic — patterns that are at least partly related to the effects of climate change — the researchers say. Sea ice, as its name would suggest, frozen ocean water is, and therefore differs from icebergs, glaciers and their floating tongues called ice shelves – all of which originate on land. Sea ice grows in the winter months, and wanes as summer’s warmth causes it to melt. 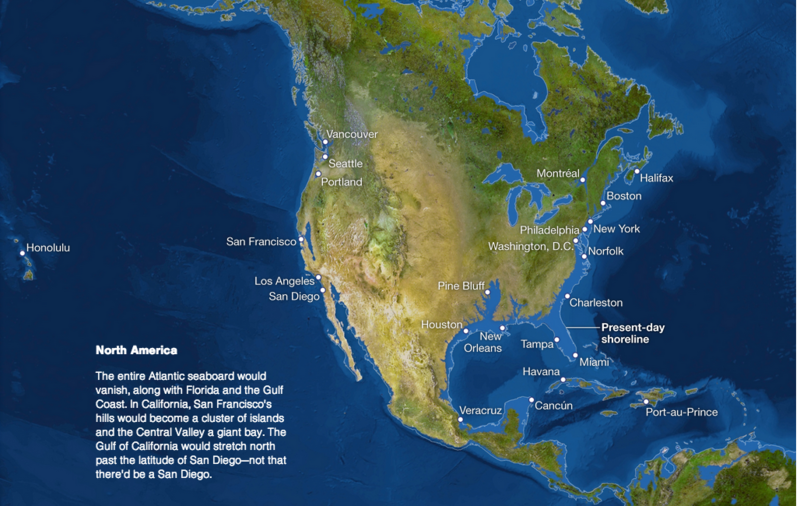 The amount of ice present can influence the movement of ocean currents — on average, about 9.7 million square miles of the ocean is covered with sea ice, according to the U.S. National Snow and Ice Data Center (NSIDC). Researchers in Australia and New Zealand wanted to see how the action of big waves — defined as those with a height of at least 3 meters (about 10 feet) — might play a role in influencing the patterns of retreat and expansion, and if they could help improve the reliability of sea ice models. Prior to this study, no one had measured the propagation of large waves through sea ice before because the sea ice is in some of the most remote regions on the planet, and icebreaker ships must be used to plow through the thick ice. To conduct their research, Alison Kohout – of New Zealand’s National Institute of Water and Atmospheric Research and the lead author on the study – went on a two-month ocean voyage with her colleagues to drop five buoys onto the sea ice that could measure the waves as they passed. It is thought that the ice behaves elastically as the waves pass through, bending with the wave peaks and troughs, weakening, and eventually breaking. What the team found was that the big waves weren’t losing energy as quickly as smaller waves, allowing them to penetrate much deeper into the ice field and break up the ice there. That exposes more of the ice to the ocean, potentially causing more rapid melting and pushing back the edge of the sea ice. The researchers also compared observed positions of the sea ice edge with modeled wave heights in the Southern Ocean from 1997 to 2009 and found a good match between the waves and the patterns of retreat and expansions. Essentially, more big waves matched increased rates of sea ice retreat and vice versa. And while they believe that this might be able to help researchers understand this regional variability around Antarctica, Kohout and other researchers agree that more work needs to be done to fully understand how waves might be influencing sea ice. Kohout and her colleagues are planning another expedition in a couple of years. and it is hoped that subsequent studies will help identify the relationship with larger ice floes as well as the Arctic. One thing remains clear though: as we move into the second and third decade of the 21st century, a much clearer picture of how anthropogenic climate change is effecting our environment and creating feedback mechanisms is likely to resolve itself. One can only hope that this is the result of in-depth research and not from the worst coming to pass! It is also clear that it is at the poles of the planet, where virtually no human beings exist, that the clearest signs of human agency are at work. Good thing I bought new swim gear. I have a feeling I’ll need it.